You don't have to be born in August to appreciate the beauty of this stunning ring. Although it would make a perfect birthstone ring, this 14k solid gold ring with natural diamonds and peridot is perfect for any lady that desires a beautiful and unique piece of jewelry. The open design of the solid gold band adds a fresh and unique look to this ring. 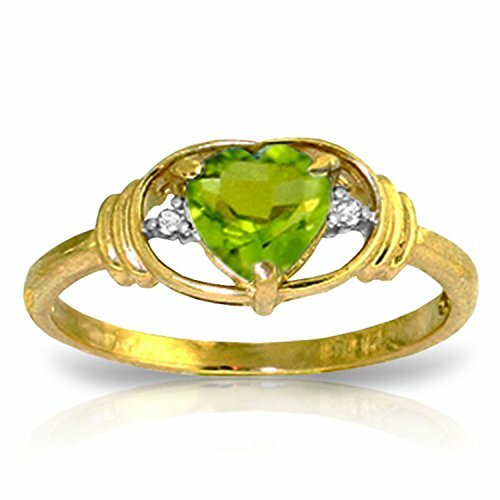 A .60 carat heart shaped peridot makes this piece sparkle and shine, while offering the beautiful green hue that peridot is famous for. Two round cut diamonds add more detail to this beautiful ring that looks great on anyone.